Many of us buy mutual funds just by looking at the past performance or ‘Star ratings’ of the schemes. Some go by the reputation of the mutual fund houses. The returns generated by mutual fund schemes vary from one fund to another fund. 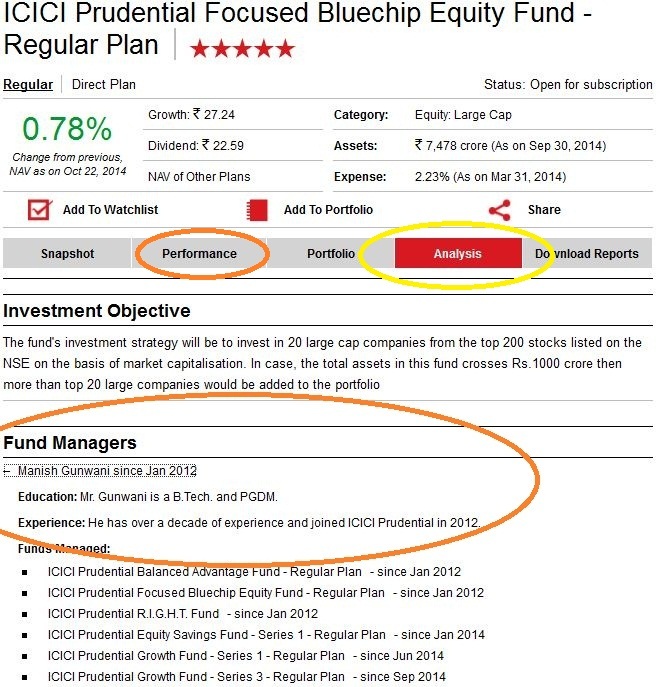 So, who is the person behind a mutual fund’s performance? Who implements the Fund’s investment strategy? Who decides when to buy or sell the assets of a Fund’s portfolio? The person whose responsibility is to oversee the allocation of the pool of money invested in a particular mutual fund. A fund manager implements the scheme’s investment strategy by selecting when to buy or sell the assets held in a portfolio. Some mutual fund houses are process-driven. Still, we can not undermine the importance of a fund manager in delivering high returns. The fund manager brings ‘the human element’ which no ‘process’ can replicate. The processes might show the direction. But, it is the Fund manager’s investment style, gut-feel, knowledge, experience and ability to identify right opportunities at the right time which are equally important. We, investors turn to funds because we want growth/returns. Fund managers can deliver it by putting our money to work. The role of a Fund Manger is very critical to the performance of the Mutual Fund Scheme. He/she has to consistently implement the Fund’s/Scheme’s investment strategy. A Fund’s strategy might be to invest only in Large cap – blue chip companies. Then it is the responsibility of the fund manager to pick companies which fall under Large cap domain. FM is the decision maker. He decides when to buy or sell the financial securities. He allocates the monies as per the goals of the fund. FM has to follow the applicable regulatory restrictions, risk parameters and boundaries defined by his fund house. FMs have a responsibility to protect investors’ money. At the same time they aim to generate growth. FMs take calculated risks to achieve this. Fund managers’ choices to buy or sell assets are preceded by a lot of research and due diligence, which can involve investigating companies or assets, attending industry events and employing risk management techniques to assess investments. Fund managers also address risk by ensuring asset portfolios are sufficiently diversified. “To deliver high returns’ – is this the only criteria to evaluate a Fund manager? If that is the case then most of the fund managers will chase returns and may take unwanted risks. Just chasing returns may prove harmful in the long-run. Consistency in delivering the returns, adhering to fund’s mandate, long-term view, past work experience, investment style etc., do matter in evaluating a Fund Manager’s performance. Every mutual fund scheme has a certain investment objective to adhere to. FM has to align all his investment decisions with this objective. Some Fund managers follow the flavor-of-the-season style and may deviate from the Fund’s objective. For instance, a mid-cap fund that invests in Large-cap stocks is straying from the objective. Investment style of a FM is very important. Is he aggressive? Does he take contrarian calls? Whether he invests all the monies? Does he sit on high amount of cash? Some Fund Managers stick to their investment style, come what may. The Fund manager who stick to their core investment philosophy even during bad times (downturns) will deliver sustained performance. If returns are the only criteria then most of the fund managers will churn the portfolio aggressively. A Fund Manager who has a long-term view holds the stocks for a longer duration. This shows his conviction in decision-making. Consistent good returns across different market periods is a good indicator of FM’s capability. His past work-experience, no of years as fund manager, quantum of assets under management (AUM), no of funds managed by him etc., are also some of the important attributes. Below are some of the top equity Fund Managers. Who is my Mutual Fund Manager? We have different ways to find out the details of fund manager. Let me provide 2 sources of information. 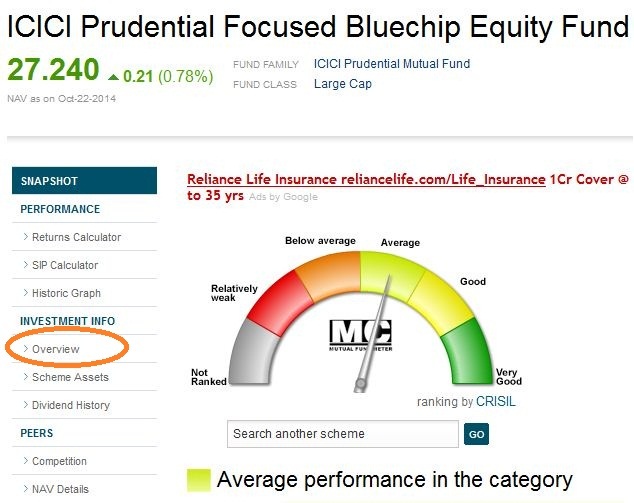 (Let us consider one scheme for the explanation sake -Fund name “ICICI Prudential Focused Bluechip Equity Fund”). Visit www.moneycontrol.com. Enter the fund’s name in “Search” box. Click on “Overview” which is available on the fund’s page. Visit www.valueresearchonline.com and enter the fund’s name in “Search” box. 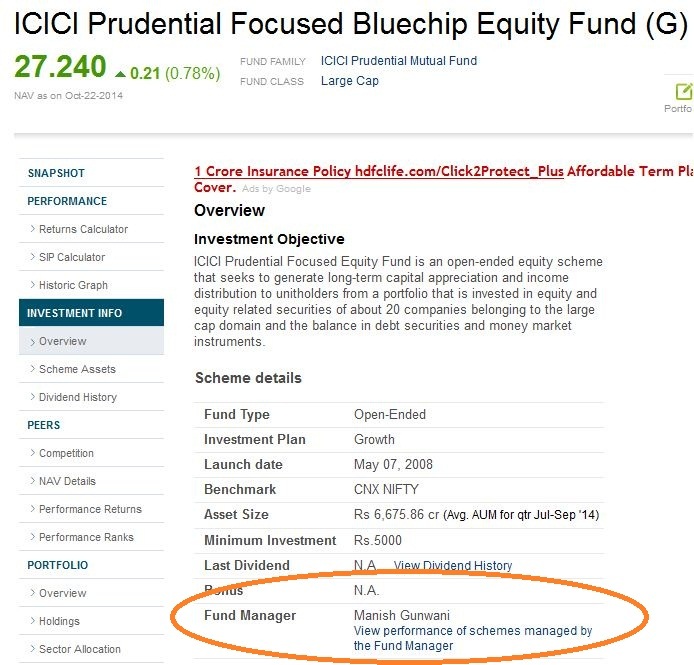 You can view Fund manager details and the other schemes managed by him/her. 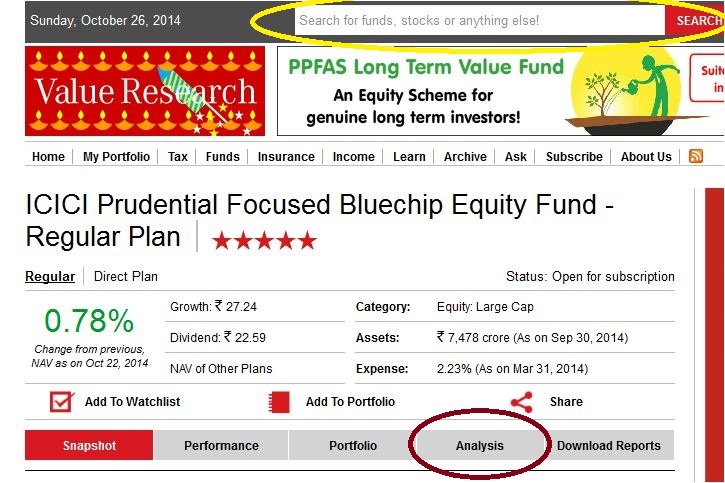 You can also find information about FM on respective mutual fund house websites. It is advisable to maintain an excel sheet with name of schemes that you have invested in and corresponding fund manager names. Review these details atleast once a year. If a new fund manager is taking care of your fund then you may observe his performance for the next 1 or 2 years. Compare the fund’s performance with that of the other fund’s in the same category. 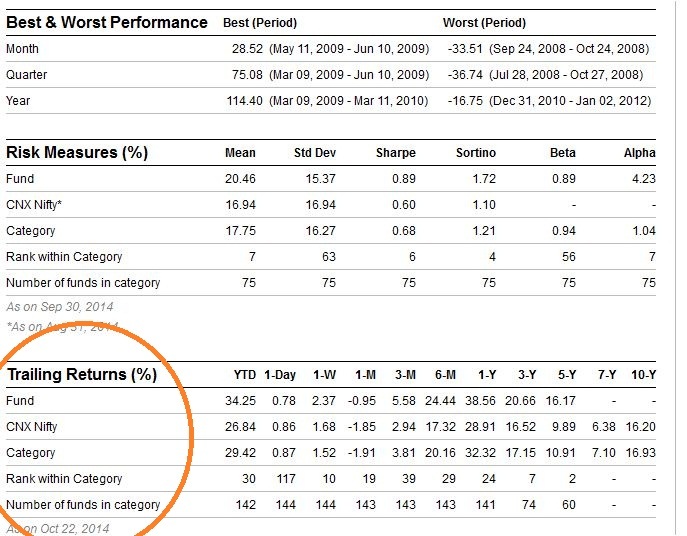 Also, compare the fund’s returns with its benchmark. Valueresearchonline.com provides this information in one place. (Click on “Performance” link on respective fund’s page. You can find details as below). To a great extent, the performance of a mutual fund scheme depends on the fund manager’s skills. If the portfolio manager who generated the fund’s successful performance is no longer managing that particular fund, one would do well to look into the implications and analyze the pros and cons of investing in that fund. Do you agree with my views? Fund manager or Fund house – which of the two is more important to you? Do you think both are important? Do share your comments. Cheers! This article i s really useful. Can u please help me out regarding some of the large cap funds which are doing well currently as it gives stable returns and good to start with.You can please mail me.i need to know the procedure for investing and is any unique id required? 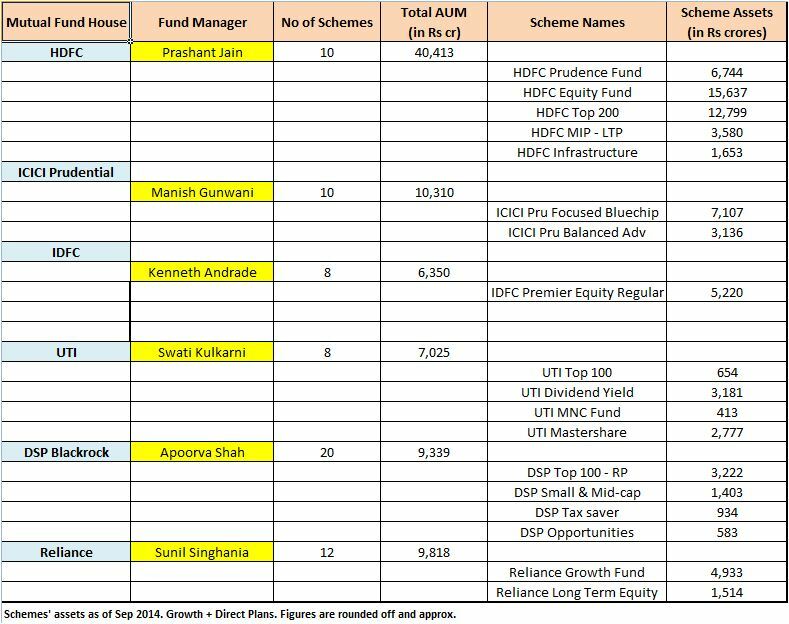 How to select best mutual fund scheme? Thank u sreekanth reddy…will get back to u after I read the article. I was looking to read more abt fund manager and bumped on your page. Useful. Dear Sharath..May I know your investment horizon? Kindly read : Best Equity Mutual Funds 2016. Sure. Suggest you to kindly reach me through the ‘contact’ page. (or) you can visit freefincal and download excel based SIP calculator(s). Very informative and helpful article.But the fund house is also important in days of crisis fund house ethics are crucial isn’t it? can u suggest me in selecting Best FM? Just invest in good mutual funds (after all MFs are managed by FMs). Read my article ; Top 15 Equity mutual funds. I liked the article. It is very informative and up to the point. Thanks.